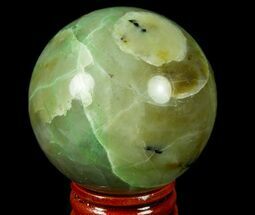 This is a wonderful, polished sphere of hematoid quartz often referred to as harlequin quartz. Comes with a display stand. Hematoid quartz, also commonly referred to as Harlequin Quartz is the name for quartz that contains heavy concentrations of Hematite or Limonite. 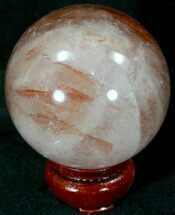 The inclusions of these iron based minerals results in interest reddish-orange phantoms within the quartz which can have a wispy appearance. Often this quartz is heat treated to enhance and darken the color but the specimens we have are natural.